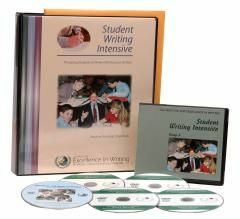 Among homeschoolers, the Institute for Excellence in writing is one of the top-dogs in writing curricula. Most of us have heard of this program and may even have a little bit of healthy fear when it comes to using it, which I will go into more detail about throughout this review! 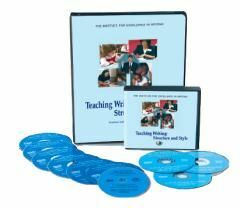 I was very excited to be able to try it out by reviewing the Teaching Writing: Structure and Style as well as the Student Writing Intensive A.
Andrew Pudewa, the man behind IEW, is one of my favorite homeschool speakers/teachers to listen to. His talks on audio that I have heard have been so inspirational and helpful. We have also used, and loved, the Linguistic Development Through Poetry Memorization and memorized many wonderful poems because of this company! So, because we are somewhat familiar with IEW and loved what we had already seen, I felt like this writing program would be very beneficial for us also. In watching the Teaching Writing: Structure and Style (often abbreviated TWSS) I learned so much about this program and the techniques for how to best teach my children to write. The TWSS is a seminar for teachers and can be used by homeschoolers or classroom teachers. I love that this is a “class” for me to help me learn how to teach writing. I also love that he goes through examples exactly like you will be doing them with your children! Very helpful! I will admit, in this review period, watching so much of it at one time, it is quite overwhelming!! (There are 10 hours of sessions to view included in this program!) It is a LOT of information. It is ALL GOOD, but just a lot. I tend to get overwhelmed when there is a lot thrown at me at once, so my recommendation is to NOT watch all of this AND start the student writing intensive in just a few weeks time frame. 🙂 If you tend to get overwhelmed, start gently and watch a little bit at a time. You do get the class workbook to go along with the DVD series which is very helpful for following along and retaining the information. My favorite part of this program is the actual DVD lessons and the student pages to go with it, which is the Student Writing Intensive. There are 3 levels of this program and we received level A, which is geared for grades 3-5. I will say that in our home, working through this program at grade 3 would have been a huge stretch, if not impossible, especially for my son. But, the girls are finishing grades 4 and 5 and this seems to fit perfectly with where they are at with writing. Having Mr. Pudewa in our home teaching my girls was just fabulous. It meant I did not have to really do the teaching myself! I did watch along with them and I did help them get going on their assignments, but I loved having a teacher there doing the actual teaching. Along with these DVD lessons, you also receive a binder that includes student handouts and daily lesson suggestions/plans for the teacher. After just 2 assignments (including Mr. Pudewa’s keyword outline and using dress-ups) my girls writing improved dramatically. After just 2 writing assignments! I was and continue to be so thrilled with their progress! If you’d like to read what other TOS crew members are saying about IEW, please click over to the crew blog to read their reviews!